In a twist of events, Google+ returns but this time in a new design. Recall that, the Google owned social media networking site was shutdown earlier this month while the G Suite version for business users was left alone. Google has announced Currents which according to the tech giant is a replacement for Google+ for G Suite. Google made the announcement during its annual developer conference geared towards Google Cloud businesses called Cloud Next 2019 in San Francisco. 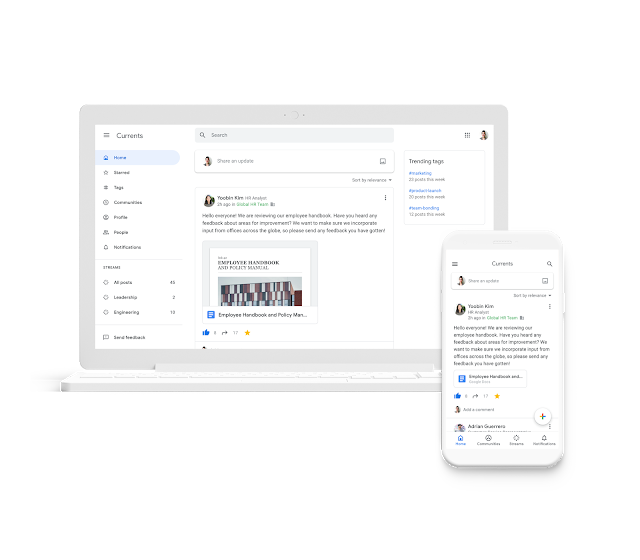 Currents which is launching as a beta version is a G Suite app with a feature similar to Slack which enables people to have meaningful discussions and interactions across organizations, helping keep everyone in the know and giving leaders the opportunity to connect with their employees. If you’re part of a G Suite group, you’ll either have to ask your Admin to enroll in the beta program or wait until it rolls out within the stable channel. Please note that end users are not required to take any action. According to Android Authority, this isn’t the first product from Google called Currents. In 2011, there was a product called Google Currents which focused on online magazines. It was eventually folded into the Google Play Newsstand, which eventually became the modern Google News.